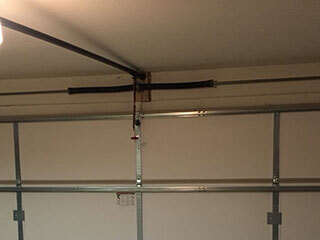 The position of the garage door springs high above the ground can prevent users from inspecting them on a regular basis. At the same time, these parts are among the most important components of your system. They provide a counterbalance to the weight of your door and are designed to ensure its safe and effective opening and closing. However, when something goes wrong, these components can quickly become the most dangerous parts to deal with. For this reason, we never advise homeowners to handle them without the right specialist knowledge and skills. We provide complete repair services for all kinds of garage door torsion and extension springs. Our experienced technicians have excellent knowledge and understanding of all the latest models on the market. We cover all types and brands to ensure that we can be of help when required. Whether you've got a severely worn Clopay torsion spring or a pair of extension springs that need their tension adjusted, we are here to help you resolve the problem. There is no way to prevent the natural wear and tear of your springs over time. However, through our maintenance services, we can help you bring the risk of premature breakdown right down. We can provide a full inspection of your overhead door springs on an annual basis, apply any lubrication, treat any rust and make tension adjustments as needed. If your springs are in need of professional attention, don't hesitate to contact our professionals at Garage Door Repair Plugerville - we've got all the experience to sort your problem with minimum disruption to your day.